Cultural Practices of Victimhood aims to set the agenda for a cultural study of victimhood. 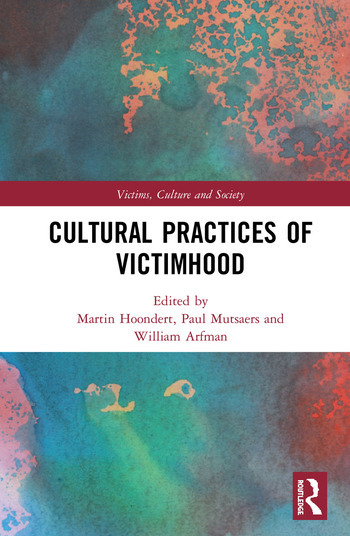 Words such as ‘victim’ and ‘victimhood’ represent shifting cultural signifiers, their meaning depending on the cultural context of their usage. Using case studies and through a practice-based approach, questions are asked about how victimhood is defined and constructed, whether in the ritual commemoration of refugees on Lampedusa, the artistic practices of an Aboriginal artist such as Richard Bell, or the media practices associated with police violence. Consisting of contributions by cultural studies experts with an interest in victim studies, this book seeks a double readership. On the one hand, it intends to break new ground with regards to a ‘cultural turn’ in the field of criminology, in particular victimology. On the other hand, it also seeks to open up discussions about a ‘victimological turn’ in culture studies. The volume invites scholars and advanced students active in both domains to reflect on victimhood in cultural practices. Martin Hoondert studied musicology and theology and is specialized in music and rituals. Since 2007 he has been(associate) professor of Music, Religion and Ritual at the Department of Culture Studies of Tilburg University. His research focuses on ‘music and death’ and ‘practices of memorialization’. Paul Mutsaers studied cultural anthropology at Utrecht University and works as a police anthropologist for the Department of Culture Studies, Tilburg University, where he is employed as a postdoctoral researcher. He has previously worked at the Police Academy of the Netherlands, where he carried out his PhD research on police discrimination. William Arfman has a background in the archaeology and anthropology of Central America, as well as the comparative study of religion. Currently, he is a postdoctoral associate and lecturer in the field of ritual studies at Tilburg University. Favouring an interdisciplinary approach, his main research interests are late modern ritual dynamics, ritual innovation and traditionality, ritual and (community) art, and ritual commemoration.